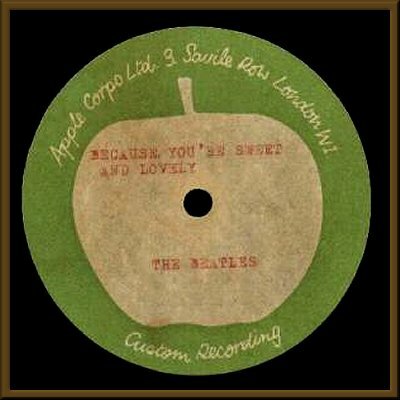 "Because You're Sweet And Lovely"
I'm going to take a guess that this disc dates from 28 February 1970. Although it could very well date from 1969. I believe the 1970 date for for the simple reason, most Beatles' 1969 acetates have handwritten labels. 1970 labels tend to be type written. Likewise, since the Malcolm Davies mix (see recording history below) was not intended for release, it was apparently mixed for his unknown personal reasons. The "red" type doesn't seem like something a normal production crew would do. Perhaps Davies made the label special for himself. In addition, the auction description seems to imply that the recording is only "slightly" different to the released mix. Any mix done prior to 28 February 1970 would have been considerably different to the released mix. Davies was working with the same vocal overdub which was used on the released mix. This disc was auctioned on eBay in July 2004 and the auction description offers very little info. MEGA RARE BEATLES ITEM !!! "For you blue" on the offical album.